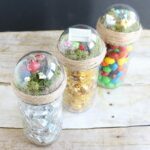 These fairy garden mason jar toppers are perfect for small gifts. Candy, bath salts, and so much more can be added to make a sweet homemade gift idea. Remove the lid and band from your jar and hot glue the two pieces together. Add moss to the top of the lid with hot glue. Be sure to cover the top completely. Add miniatures of your choice to the top with additional hot glue. You can use as many or as few as you would like. Just be sure that they are not too tall and your ornament half will fit over the top. Then place the ornament half on the top of your lid and secure with hot glue. Remove any excess moss around the edges with your scissors. Start wrapping twine around the bottom of the lid covering the joint where the ornament meets the lid. Use hot glue to secure the twine. You will also want to trim the hanger off the ornament with scissors as well. Completely wrap the bottom of the lid to hide it. Secure the end with hot glue. Fill the jar with your gift and add the decorated lid to the top. This project for Fairy Garden Mason Jar Toppers was printed from CraftsbyAmanda.com - https://craftsbyamanda.com/fairy-garden-mason-jar-toppers/ and can only be printed for education or personal use.